Home › Pix of the Trade › Giving back! Volunteers from Allianz Global Assistance Canada assembled in the pre-dawn hours today (May 2) at Toronto’s Pearson Airport to assist in the departure of more than 100 special children and their caregivers for Air Canada’s Dreams Take Flight, offering a fun-filled day at Disney World in Orlando for kids with special needs and/or their siblings. Since its inception in 1992, Dreams Take Flight (Canada) has enabled thousands of children from across Canada to visit the Magic Kingdom and fulfill their dream travel wish. 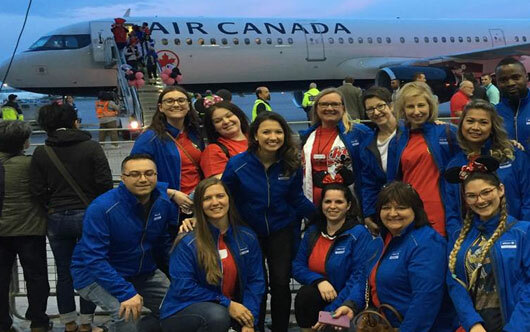 The employees of Allianz Global Assistance Canada have been strong supporters of Dreams Take Flight, volunteering their time and assistance to the young travellers for more than a decade. Allianz is a national sponsor of Dreams Take Flight.